Following the defeat of CyberFace and the rebuilding of the United States, a new incarnation of the Special Operations Strikeforce was put together to serve and protect the nation. 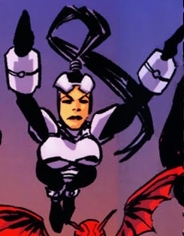 Stinger was one of the new recruits for the team and served with them to deal with such threats as the Vicious Circle, the Forever Serpent and the Nuclear Man. When the S.O.S. were sent in to stop the global invasion of Earth at the hands of the Tyrrus Combine, the heroes were almost completely annihilated. Stinger died alongside her teammates and only SuperPatriot managed to avoid death at the hands of the aliens.